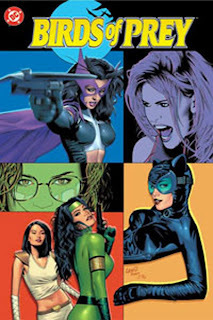 Let me say first of all that Gail Simone has breathed the life into Birds of Prey that I think was there once upon a time, perhaps back when Birds of Prey was actually one-shot specials, but recently got lost among Bat-crossovers and slews of guest stars, often pushing the Birds out of their own book. Simone writes a Birds that, stylistically, doesn't always hit me quite right, but I would nonetheless proclaim it as fun, interesting, suspenseful, and more than anything else, true to the characters and their sometimes long, complex histories. I applauded Simone's choice not to start Sensei and Student with Huntress as an automatic Bird, but to let her choose to join at the end of this trade. Though it still seems like Huntress joined without much complaint, I imagine that for those reading Birds as a monthly, it felt like more of a natural progression. And while the middle of Sensei and Student lost me somewhat, it certainly redeemed itself with the last chapter. Simone points out, rightly so, that Oracle and Black Canary are (with no diminution intended) the female Batman and Green Arrow (or, at least, Nightwing and Arsenal). In essence, through Huntress's relationships with Nightwing and Arsenal in other books, the powers-that-be have placed Huntress right in-between the two -- she has Nightwing's overall idealism, with Arsenal's loose cannon tendencies. I oversimplify, certainly, but the point is that I have great respect for Simone for realizing Huntress's natural place as a Bird. Having just read Simone's two Birds of Prey collections, Sensei and Student is definitely my favorite. I've always felt Birds of Prey works best with the characters in exotic locations, and Sensei and Student delivered, all the while letting the characters drive the location--Black Canary travelling to visit her sensei, and ultimately being the target of Cheshire's plot. Simone adds a level to Lady Shiva that raised her above the standard "I want to fight everyone" characterization, and I think I understand Cheshire, from her poison to her feelings for Lian, better than ever before. These villains (if they can still be called that after Simone's excellent "shades of grey" portrayals) were so good that I was somewhat disappointed to see Savant there, so soon after Of Like Minds. Two things, I think, can ruin a villain faster than anything, and that's overexposure and camp (It's true! Doomsday, Bane, Darkseid -- they all go sour when they show up everywhere, and when they start spouting Ming the Merciless dialogue). Savant's got both. I think he's a good villain, I like the whole "can't remember anything" bit, but he needs to go out to pasture for a while, and then reappear when we least expect it. Otherwise he'll just become old hat. And speaking of villians, I still can't understand what made Black Canary go look up her mother's files to discover that the Senator's father was a serial killer, and I think it's indicative of a small difficulty I have with Simone's comics. There are times that she takes dramatic leaps, withholding information from the audience for purposes of suspense, that instead of going "hmm," I just go "what?" For instance, in Of Like Minds, Simone whips past Savant demanding Batman's secret identity from Oracle, so that the reader is surprised by the request later. A good narrative idea, in theory. But in practice, we're reading along and for a moment, Oracle has a handle on the situation, and the next time we see her, she's in a panic and calling Huntress. To me, it was more confusing than suspenseful. This was true, too, in the above example, where Dinah goes to read her mother's journal. I didn't, and still don't, see what made her think of this (nor, for that matter, what made Cheshire think the Senator was her father). The books were still enjoyable, but these parts bugged me, and the fact that the issue reocurred makes me think that it's just an aspect of Simone's style, where her tendencies and mine differ. I'll be interested to see if there's another example in the next Birds trade. And how about that next Birds trade? And while we're on the topic, how about Simone's Rose and Thorn mini-series collected in trade as well? Now that she's about to get the reins to Action Comics, it seems only fair. I'm on to re-reading the first Catwoman trades, toward Catwoman: Relentless, then Batman: War Games Act One, Flash: Ignition, and JSA: Prince of Darkness. Come with me, won't you? I think both those questions ARE answered in the book, if very subtly. First, Dinah says something the Senator's father says reminds her of something. When we see her next, she's looking at her mother's files. I think that's pretty easy. The thing that was nagging her, is the senator's father's odd phrase, "pretty as a holiday peach," which he says at the Senator's mansion, and which the killer in her mother's files also used in his letter to BC 1. It's not, obviously, a common phrase. It's not coincidence, either, as it's pretty clear the Senator's dad uses his grandson for revenge. Anyway, interesting review, very cool and lively. Thanks! No doubt you're right. I'll look for that when I read the trade again around the time the next Birds of Prey trade comes out (Birds of Prey: Between Dark and Dawn TP? Is it too soon to start hoping?). Again, you've done us all a service, breathing new life into Birds of Prey. Thanks for stopping by; much obliged! I love Gail's work on both Birds of Prey trades. She brings a more human touch to the BoP which I love. Here's to more fantastic issues, Gail!